[Friday, June 20, 2014] The Save the Hollywood Coalition has released a comprehensive plan to reinvent the Hollywood Theatre as a heritage-designated, public arts and culture venue. The business plan, presented to the City’s General Manager of Community Services, Brenda Prosken, provides a detailed accounting of the Coalition’s vision for acquisition, renewal and operation of the Hollywood in the context of Vancouver’s broader arts and culture landscape and relevant City policy. Recommendations by Vancouver’s Creative City Task Force led to the City’s adoption of a new Culture Plan for Vancouver 2008 – 2018 that seeks to “increase public participation and community engagement in arts and culture” by “promoting local arts and culture” and by “improving arts access for new and under-served communities”. 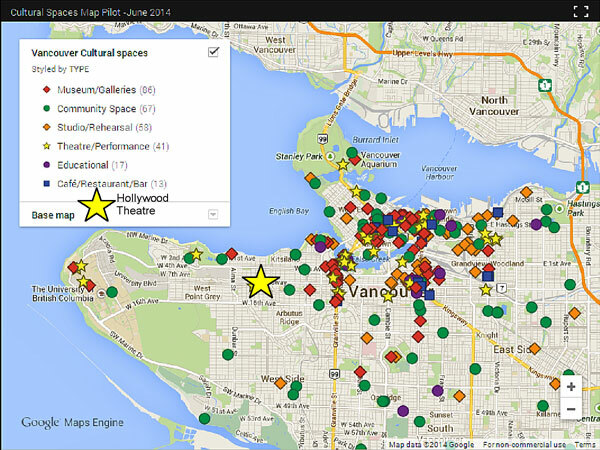 At this very moment the City is updating its register of cultural spaces through an interactive, on-line mapping project and results unfortunately confirm what locals already know; that there’s a significant lack of cultural capacity on Vancouver’s westside. The iconic Ridge Theatre and the Cellar Jazz Club are only the latest casualties, and not because these cultural enterprises weren’t successful, but rather because they were simply swept aside in the wake of Vancouver’s surging property market. City Hall is well aware of this dilemma. At a recent forum organized by Vision Vancouver, titled “Protecting Vancouver’s Cultural Spaces: Preserving Culture In A Growing City”, Councilor Heather Deal was perfectly honest in admitting that “the City could do a lot better” and the Coalition agrees. In fact, thanks to an amendment put forward by Councilor Deal in November of last year, the City’s Heritage Action Plan was adopted with specific direction to “assist community objectives for heritage preservation” with respect to the Hollywood Theatre. So, why is the City sitting on the fence and keeping the Coalition on the sidelines as negotiations between the Hollywood’s owner and the Point Grey Community Church appear to be headed for an outcome that will neither protect the Hollywood’s heritage nor realize its fullest potential as an arts and culture venue for the broader community? What’s clear is that City Hall does not want to own the Hollywood. What’s not clear is why. There is surely no shortage of precedents to confirm the stability and value of city-owned cultural spaces, now numbering more than 50 and with the majority operated by non-profit arts and culture organizations. As secure public assets and with the benefit of favourable leases and property tax exemption, these city-owned cultural spaces are uniquely viable and offer unmatched long-term stability in the context of Vancouver’s soaring property market. There is simply no evidence to suggest that any other model is capable of delivering similar public-use capacity. The Coalition is confident that a city-owned outcome is achievable for the Hollywood and that it is the only outcome that will enable the theatre to realize its fullest potential. By transferring buildable density from the Hollywood site to the owner’s adjacent property, and by waiving related development fees (DCLs), the residual value of the Hollywood can be dramatically reduced and potentially written off. Far from unaffordable, the Hollywood represents a unique opportunity to establish a landmark arts and culture venue for a tiny fraction of its value. Failure to seize the moment would deprive the City and its taxpayers of a very attractive investment. Extensive market research and consultation with arts and culture organizations across Vancouver has confirmed strong demand for additional media/screen and live presentation space and the Hollywood is uniquely suited to supply both. Conservative budget figures presented in the Coalition’s plan demonstrate the Hollywood’s potential to be a fiscally sustainable enterprise while contributing very productively to Vancouver’s cultural capacity. Strategically located on the Broadway Corridor and in the heart of Kitsilano, the Hollywood is perfectly positioned to entertain and inspire an under-served public that is destined to grow. It’s time to put the Hollywood back on the map! From Creative City to Engaged City the Coalition’s plan to Reinvent the Hollywood is perfectly aligned with a broad array of progressive city policy. Dig in. Read all about it. Why is City Hall avoiding the Hollywood’s brightest future? Music video shot at the Hollywood! Thank you to all members of the Coalition for such a fine, well-thought-out business plan for Reinventing the Hollywood Theatre! It deserves to be acted upon. I would love to see this become a full time comedy/Improv venue. I have lots of ideas on how this could be successful. If you leave a few pages of the petition at Just Imagine Fun Clothing we’ll see if our customers would like to sign it. 3060 West Broadway. Thanks! Please let me know if the “coalition” is talking to city council. how does the Hollywood relate to the Rio potentially from grant, support pov? What is holding up raising funds to buy the theatre first, so it is not threatened by the present owner and whatever “market” plans he might get that could lead up to demolition eventually. the Hollywood should be owned by a society, that could then raise money to redevelop the important heritage project, that is the most important heritage building in Vancouver, Canada now. Thanks for your comments – we competely agree that ownership by a community-based society is the way to go, and our business plan lays this out in great detail. As for your other questions: we are continuing to be very active in the background, as it is a sensitive time. We are continuing to explore and pursue a number of different options and we will be able to inform the public to a greater extent in September, when many of the various groups involved are back in town. Be sure to subscribe to our mailing list to get first notice of any news or updates!